Picture this situation: it's a cold, damp Sunday in autumn. Milan is playing a league game dubbed as a must-win by the media. In midweek, Milan is playing a Champions League game dubbed a must-win by Berlusconi. Next weekend, Milan is playing Juventus. Naturally, we need to win that. After that there's that pesky midweek round that will provide a chance for Inter to close in on us. We gotta win that one, right? This continues until the league is won. Every game is a must-win in its own right. So we should have our best player play 90 minutes of every game until he breaks mentally and physically...right? What you see in the blurry image above is Zlatan vomiting at the end of the first derby last season. After such a performance, one would expect him to be given a break, if not in the next game then after that. But in the week that followed, he played 90 minutes in 3 consecutive games, winning two of them with his goals. That's all you could ask from a player, but let's look at the consequences. The player that dominated nearly every game in the first half of the season with his imposing physique looked unrecognizable by February. He still put in decent performances but he had trouble creating space for himself. Admirably, he played for the team, but not scoring for a while finally got to him as his frustration grew and he ended the season in a chaos of suspensions and palpable anger. I can't help but feel that all of that could have been prevented if he had been given a rest a couple of times. Just a few games that were winnable without him. Now, last year there was an excuse. Pato was injured for a while, Pippo was out all season and Cassano arrived in January as a player who was only fit enough to play 30 minutes. Allegri couldn't afford to give Ibra a break for a long time, and he delivered, becoming a figure the rest of the team could rely on to lead the line when the midfield isn't creating chances. This year, there are no such excuses. With 5 strikers like Pato, Robinho, Ibra, Cassano and Inzaghi there is absolutely no reason for any of them to play every game. I believe Ibra and Pato should be our starting duo but both need a break about once a month, Pato to avoid over-exerting his tender muscles and Ibra in order to avoid seeing him half-dead by the time Champions League knockout rounds come around. 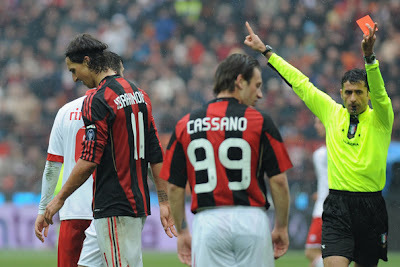 Pairings such as Robinho-Pato, Robinho-Ibrahimovic and Cassano-Ibrahimovic have worked in the past and they need to be used on occasion if this season is to be succesful, especially if Milan is to play on two fronts in the spring. There are many games that are perfectly winnable without a giant Swede on the pitch, but a Champions League quarter final isn't likely to be one of them, and neither is a derby in week 37.